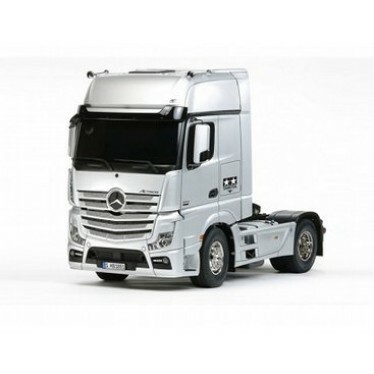 Tamiya 56335 a kit of the Mercedes Benz Actros 1851 Gigaspace truck. The 2012 Truck of the Year award-winning Actros series is the flagship of the world's leading truck manufacturer, Daimler. Its latest instalment, the rear-wheel drive Actros 1851 GigaSpace runs on a 12.8-liter 6-cylinder turbo-charged engine generating 510hp and is used for long-distance haulage, heavy duty distribution haulage, construction haulage and so on. The Tamiya 1/14 scale R/C kit faithfully captures all the detail of the full size rig using ABS plastic for the body parts and a 3-speed, shift on the fly working transmission. Enjoys superb driveability thanks to its float-mounted die-cast front axle and reinforced resin rear axle. A wide variety of Tractor Truck Option Parts are available for you to further customize your machine.